Coupons.com, known for its discounts and relationships with consumer products goods companies, will release a free voice-activated app Thursday for Google Glass. It puts brands at eye level with consumers through emerging technologies. Brands have an interest in sponsoring recipes, said Bruce Sattley, vice president of product management at Coupons.com. The app will search ingredients. Tomorrow, users will have the option to search calorie counts and dietary requirements. KitchMe for Glass uses the recipe and meal-prep features from the recently released KitchMe.com Web application. It can find recipes by keyword voice recognition, then swipe to browse search results. Consumers can search for recipes based on what’s already on hand in the kitchen or by what's on sale at the grocery store. Simplicity isn't easy to get right, according to Gene Reddick, software architect at Coupons.com and founder of KitchMe, who developed the app. He said there are about a dozen features the app could offer, based on its search architecture, such as keeping track of what's in the user's cabinet to make sure she has all the ingredients. Tie that to discount offers from brands and consumers could build a whole meal around specials and discounts at local grocery stores. The app offers thousands of handpicked recipes that have at least four out of five stars on the apps rating system, which cooks can prepare them in less than 45 minutes. There is also an ingredient list with cooking directions, and the camera allows users to snap photos of cooked meals and share them with friends provides. The biggest challenge for Coupons.com and the brands it attracts is consumer adoption and whether it makes sense for CPG brands. 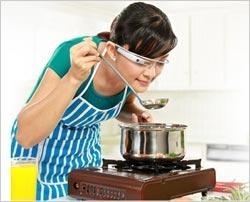 Google gave about 8,000 explorer applicants the opportunity to purchase one Google Glass for $1,500 each. Timothy Jordan, Google Glass developer advocate, recently presented a session about developing apps for Glass. He called the audience the pioneers that decide how today's technology changes tomorrow. More recently, the Project Glass team demonstrated a series of possible searches.